Transatlantic relations have reached (another) inflexion point. Europe is mired in a crisis that could weigh upon the sustainability of the United States’ road to recovery, and indirectly influence the outcome of the 2012 presidential race in the U.S. More broadly, it is likely to lead to a reconceptualization of how the United States sees both its role as a “European power”, and the extent to which Europe is able to remain an important flywheel of America’s global strategy. Only a transatlanticist Europe, able to adopt a global posture, can seriously think of becoming a valuable partner for the United States, especially as Washington is refocusing on Asia-Pacific. Presidential elections in the U.S. have always been important to international politics, so international relations scholars are debating how the next American president might change the direction of the country’s foreign policy. The article analyses the key issues of the 2012 presidential elections, the changing role of campaign finance policy (Citizens United v. FEC), changes in Americans’ view of religion, and possible variables that may affect the presidential transition in 2012. 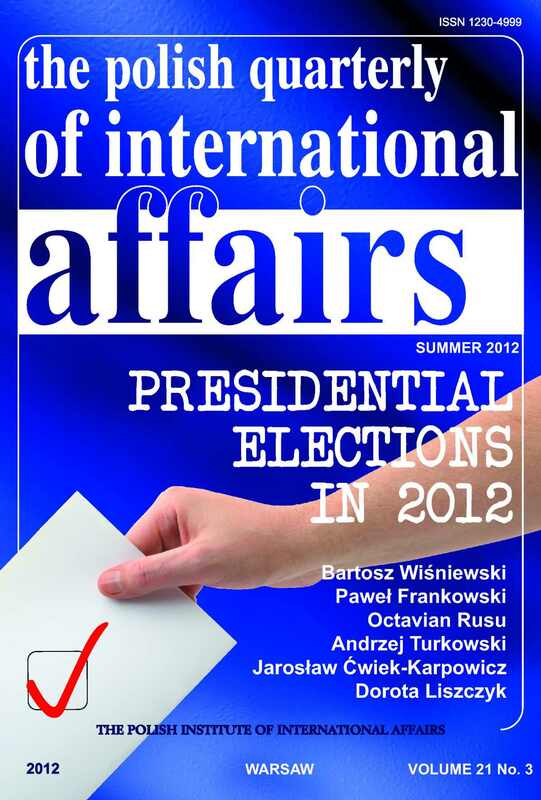 The article also examines possible scenarios for the next President based on each of the main candidates’ views, the prospects of American foreign policy after November 2012, and major trends and patterns in terms of strategic and political contexts. Russia and the West: What are the Implications of Putin’s Return to the Presidency of Russia? The return of Vladimir Putin to the Kremlin was largely seen in the West as bad news for Russia–West relations. By reasoning from a unit-level perspective, many analysts and journalists in the West exhibited a pessimistic vision. This article suggests that internal variables could instead lead to positive dynamics in relations with the West (especially with Europe), and argues that the general trend of Russian foreign policy toward the West will be influenced by systemic and external variables. The U.S.’s strategic behaviour within the context of the global shift of power to Asia will play a special role in the West’s relationship with Russia. The return of Vladimir Putin to the presidency of Russia is not likely to bring a substantial change to the country’s policy towards the West. Relations with the U.S. will continue to develop on two tracks, with both tension and pragmatic cooperation between the two states. Russia’s partnership with the EU and its Member States has been hampered by mutual disappointment, a lack of capabilities to overcome obstacles as well as by the eurozone crisis. In a broader view, it obvious that a stable basis for Russian relations with the West have not yet formed. On 6 May 2012, the French chose a new president, François Hollande of the Socialist party. The future shape of French European policy lies in the most important questions raised by this change. Traditionally, European issues were reluctantly included in the pre-election debate. Nevertheless, the problems affecting the EU and the accompanying discussions about the future of Europe meant the candidates for president could not remain completely indifferent to these issues. Because campaigns never take part in a political, economic or social vacuum, the EU debate was strongly influenced by the country’s economic situation, the public’s expectations as well as the dynamic EU agenda. Ana Martiningui, Richard Youngs (eds. ): Challenges for European Foreign Policy in 2012: What Kind of Geo-Economic Europe? Adam Balcer, Nikolay Petrov: The Future of Russia: Modernization or Decline?